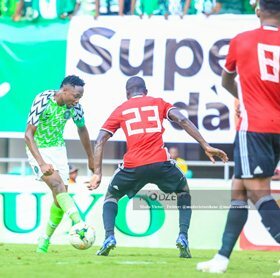 Super Eagles captain against Libya, Ahmed Musa, has admitted that things were not easy for the national team despite picking up two wins and six points against the Mediterranean Knights. Musa has been one of the shining lights for the Super Eagles in their bid to qualify for their first Africa Cup of Nations since 2013, and has been involved in 4 goals (2 goals, 2 assists) in the last three qualifying matches. On Tuesday evening, the former Leicester City striker and Odion Ighalo had fired the Super Eagles into a 2-0 lead after 17 minutes but it was wiped out by Mohamed Zubya and Ahmad Benali. The North Africans went in search of a winner after the goal scored by the Crotone star but AFCONQ leading scorer Ighalo broke their hearts when he netted the winner in the 81st minute. Speaking post-match, Musa stated : ''We are happy to win because it is a big step for the Super Eagles in the group to qualify for the 2019 Africa Cup of Nations in Cameroon''. If Nigeria beat South Africa in November, they will be guaranteed qualification to CAF's flagship tournament with a game to spare.